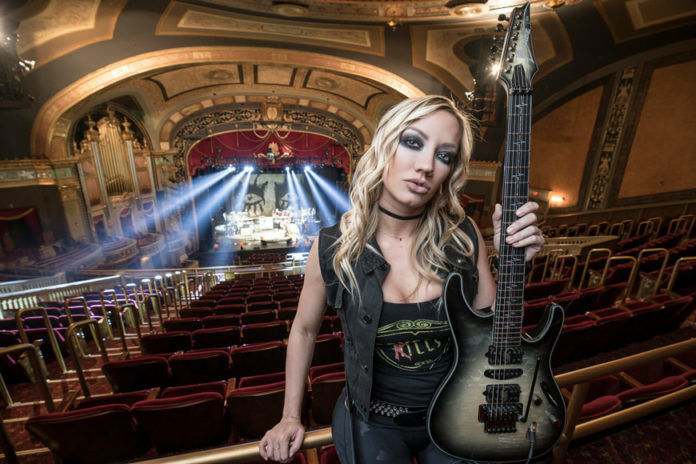 We spoke to multifaceted shred queen Nita Strauss (Alice Cooper, Iron Maidens) directly after her first solo show and the live debut of Controlled Chaos to talk about guitar technique, The Guitar Collective tour, balancing life on the road with Alice Cooper and her own material, and, of course, all about her new album. How are you feeling after the first show of the tour? Exhilarated! I’m happy, I’m thankful, more than anything I’m overwhelmed with emotion and happiness at this moment. So many people came out. The response was so great, and jamming with Angel [Vivaldi] and Jacky [Vincent] was insane. I’m just beyond words thrilled. “Tornado of Souls” was amazing. To trade off with two guitar players on a song like that is my dream, for sure. Having been in many bands playing other people’s songs, how does it feel to be able to perform a full set of your own material? I’ve been in original bands. I’ve played a lot of shows playing my own music, but this one was different because there was no vocalist to work around and it was a style of music that I could just be purely me. And that was really great. How did being in those bands influence your solo album, Controlled Chaos? Playing all the Alice songs, especially those kinds of hits, gives you a really good sense of melody and song structure that I definitely didn’t have before. So, I hope I carried some of that with me onto my album. How long was the solo album in the works? It’s been in the works for years. It’s something that I’ve wanted to do for years, and there just wasn’t the time. The thing that made this the right time was having time, if that makes sense. Alice Cooper spent the summer touring with the Hollywood Vampires, so that gave me a chance to really zero in and focus on this. How did crowdfunding help in getting the album made? It was actually Josh [Villalta]’s plan from the very beginning. He said we should bring it to the fans and do a Kickstarter. I was really reluctant at first. I warmed up to the idea, and we set a modest, small goal. And before we even pressed launch, I was thinking if we don’t make the goal, which is $20,000, in a month, how much of my own money can I afford to put in, since Kickstarter is all or nothing and the 20K would have covered the recording costs, the cost to print the actual CDs, the shipping, mixing, mastering, and a little bit of publicity. We hit that goal in two hours, and then we doubled it by that night and tripled it the next day. It just really showed me that people cared about what I was doing, and that really lit a fire that drove me forward. Exhausting, but really fun. I learned a lot about myself as a guitar player and as a person. I think I’m better for it. Do you write when you’re on the road or only when you’re home? I write anytime I get a chance. So, a lot of the final recording that you hear on Controlled Chaos was actually done on the road sitting at a desk in a hotel room or the back of the bus or really anywhere I could set up my laptop. Is there anything you didn’t get to do on the album that you wanted to do? That’s a great question. No, I think it’s a complete thought. I’m happy with it. There’s always room to do more for the next one. Controlled Chaos has a wide range of songs, from ballads like “Here with You” and “Hope Grows” to shred thrash songs like “The Quest” and even some black death on “Lion Among Wolves.” What type of song is your favorite to play and write? Picking a favorite song is like picking a favorite child, or a favorite Funko (laughs). You just can’t do it. I think they are all my favorites in different ways because they all represent different parts of my personality. Do you have a favorite to perform live? “Pandemonium” is really fun for me to do live. Because I’ve played it so many times live, I’m comfortable with it. “Our Most Desperate Hour” is going to be my favorite because that one is all-encompassing with all the different parts I like. How did Controlled Chaos being on Sumerian come about? Sumerian came to the table after the Kickstarter was done and after everything was finished. They said, “We believe in you, we believe in your vision, we want to put this out the way you want to, we aren’t going to interfere with it, we’re just going to grow it bigger and better, and we aren’t going to control or change what you do, we just want to help you push it.” We formed a real partnership with them. Much different from any record deal I’ve heard of where we really work in a symbiotic relationship towards the same goal, and that’s amazing. Working with them has been absolutely amazing from day one. There was a decline of shredder and instrumental guitar lead albums, and solos became a thing of the past. But in the last few years, instrumental bands, both prog and shred, have made a huge come back. Why do you think that’s happening? Because guitar is awesome, and people are starting to remember it. The world needs more guitar. I think that’s a big part of what’s wrong with what’s going on in the world right now. You see the biggest pop stars in the world—P!nk has Justin Derrico playing guitar, Rihanna has Nuno Bettencourt playing guitar. It’s a testament and a sign that the world needs more shred guitar. 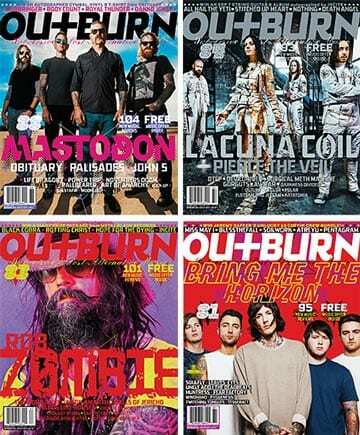 Do you think bands need to have vocals to reach the masses, and that shred albums just appeal to musicians? No, I definitely think they could reach the masses if the masses were properly exposed to them. It’s not a common thing to have an all instrumental album, and if more people heard it, they would like it. Would you ever have a vocalist on future solo songs, and if so, what singers would you choose? Oh, yeah, Alissa [White-Gluz] knows she’s my first call. She knows that for sure. I would never sing myself (laughs). I guess never say never, but I don’t think I would ever. 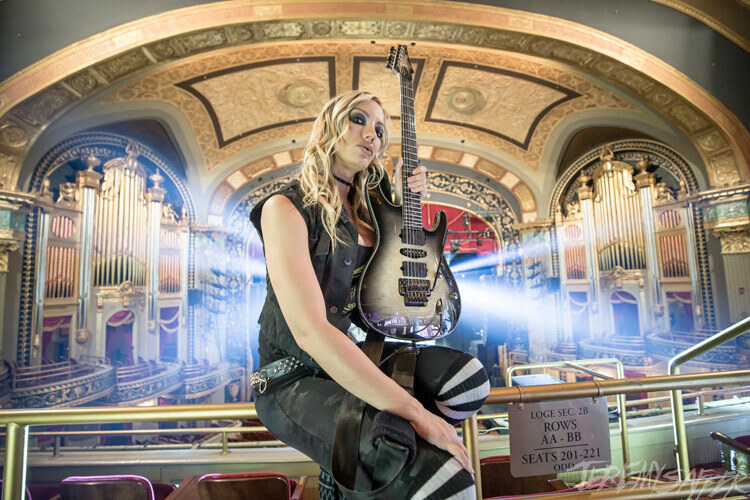 Who are some of the shredders that inspired you to get into the style you play? Are you more of a theory based player, a feel/sound player, or someone that blends both? Not much theory going on up here in the little brain (laughs), but I know a little bit. I’d like to know more, but I’m much more of a feel based player. Can you tell us about your signature guitar? Yes, my signature guitar, the JIVA, is the guitar I’ve always wanted to play. It has all my favorite features on it, from the toned woods to my signature pick ups to the design and the colors. It really is my dream guitar. Is it available for everyone to get? It is available, and it’s in stores. I saw it in Guitar Center the other day. It was awesome. Besides Controlled Chaos, you have another album in stores right now because you played on the live Alice Cooper. Yes, A Paranormal Evening at the Olympia Paris. 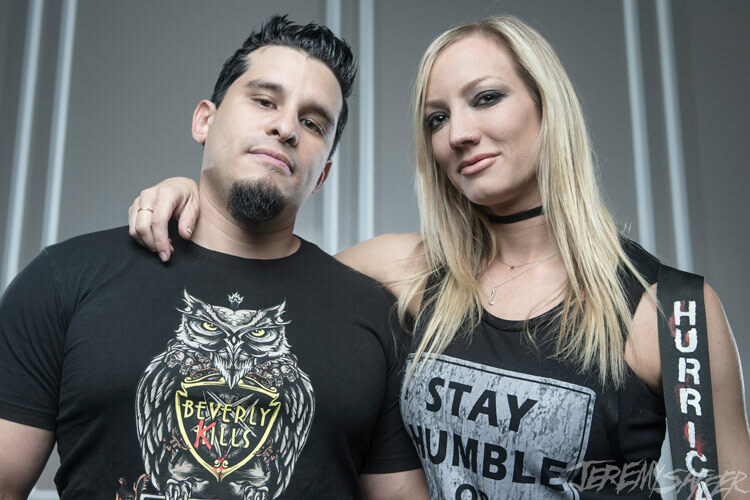 It was actually recorded on my birthday, so if you listen to the full album, in “School’s Out,” you can hear him say, “Birthday girl Nita Strauss,” and it really was my birthday, which is cool. Josh Villalta, your manager, partner, and drummer, is a big part of your life. How did he first get started in your career? Josh and I had been dating for a few months. We joke about this a lot, but it really is true. I moved into our place, like immediately we started hanging out and I just never left (laughs). So, he would always hear me doing my business on the phone, and I would get off the conversation and he would go, “You know, that’s not how that works. That person is taking advantage of you.” And I was, “What do I say?” And he’d say, say this, and I’d say it and then it would work out. Then the next time would come around, and he’d go, “No, you can’t ask for that. You need to ask for this.” And finally I was like, “Can you just talk to them for me?” And he said, “Yeah, if you want me to.” And then he started having conversations for me. Finally, I was like, “Would you help me? Would you do this for me?” And we sat down and we actually have a formal contract. It’s not just like, “Hey, do this for me because you’re my boyfriend and we love each other.” We have a formal contract. We split money. It’s a real working relationship, as well as a loving relationship. Was he your first choice for a drummer? First and only. I don’t think I would have an easy time finding someone else that could play those drum parts. Is it a great feeling, being able to look behind you and see your partner, manager, and drummer right there? Literally, behind me, it’s a great feeling. Josh knows me better than I know myself. He knows what I’m going to do before I do it, and to have somebody that’s that intuitive, most bands would have to play together for years to have that kind of chemistry. So, for us to have it right out of the gate is really special. What can people expect from seeing you live on this tour? I’m going to play all the notes, head bang a lot, and flip my hair a whole lot. It’s going to be a blast. Will you only be playing songs from Controlled Chaos? We are doing one Alice Cooper song as well. 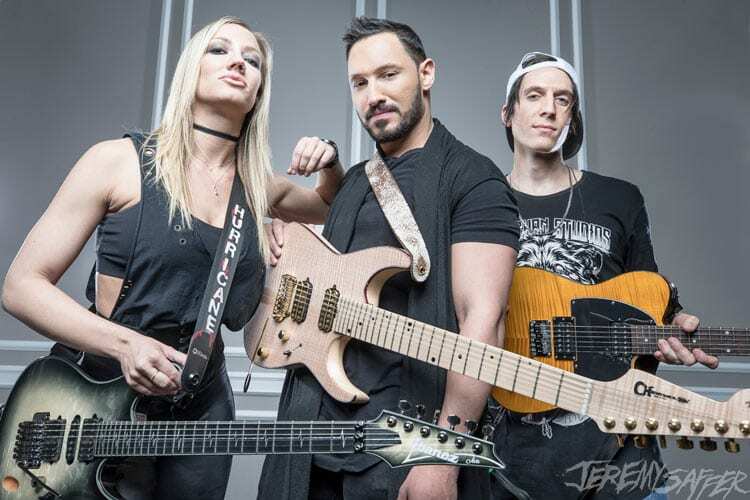 How did you end up getting connected with Angel Vivaldi for The Guitar Collective tour? 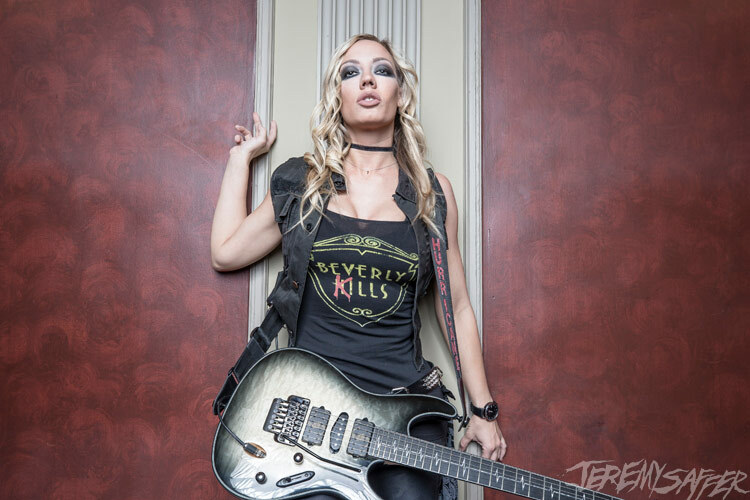 I’ve been the unofficial president of the Angel Vivaldi fan club for the past five years. We’ve been in touch, and we’re great friends. I played on a song on his album Synapse, which we’re playing live on this tour together. We talked about touring together so much that when he was doing this leg of The Guitar Collective and he approached us about doing it, of course, we jumped at the chance. When you’re on tour, what do you listen to? Is it different from what you listen to when you’re at home? It’s not so different, mostly podcasts. We are big podcast people. Besides that, it’s a lot of Sumerian bands. I’ve been listening to the Sumerian heavy lifting playlist. That’s been my jam lately. What are some podcasts people should be checking out? I’ve been listening to this one called The School of Greatness. It’s with a guy Lewis Howes. He takes people who are successful in all different avenues of their life and all different walks of life, and he tells their story and talks about it. It’s really interesting. A lot of people are surprised that you have a well versed taste in all subgenres of metal. What are some of your favorite bands? Oh gosh, I love Dream Theater. Every time I get the favorite band question, I’m like, “I don’t know what bands I like.” (laughs) Metallica, Dream Theater, All Shall Perish—I was listening to them earlier, so I’ll give them the nod (laughs)—At the Gates, Sepultura. 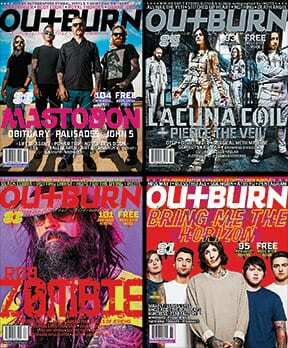 Oh yeah, In Flames is like my favorite band (laughs). What other projects are you involved in currently? As of right now, I’m 100 percent focused on my solo stuff. My band We Start Wars is still a thing whenever we can all find the time for it, but getting six people together to do a project is next to impossible. So, right now it’s just full speed ahead on the solo stuff. You’ve also had a few spots on WWE. How did that come about? All the credit goes to my boy Josh. Josh is a visionary. He sees things and finds ways to make them happen. Even if there is no clear path to making it happen, he will find a way to kick down doors and make roads where there are no roads until we get there. WWE was a huge goal of his, and Wrestlemania was something that he envisioned. Through hell and high water he got us there. Will we ever get to see you smash a guitar over a wrestler’s head? Hey, they’ve got my number. You also recently had another huge moment playing “America the Beautiful” at a Rams game. That was where I saw my first football game, so it was really cool to get to play guitar. It was a part of salute to service weekend for Veterans Day, so to get to honor our troops and get to play guitar at the Coliseum were two dreams come true. What are some other dream goals you’ve yet to accomplish? We were just saying this the other day that I think we need to get some new goals. 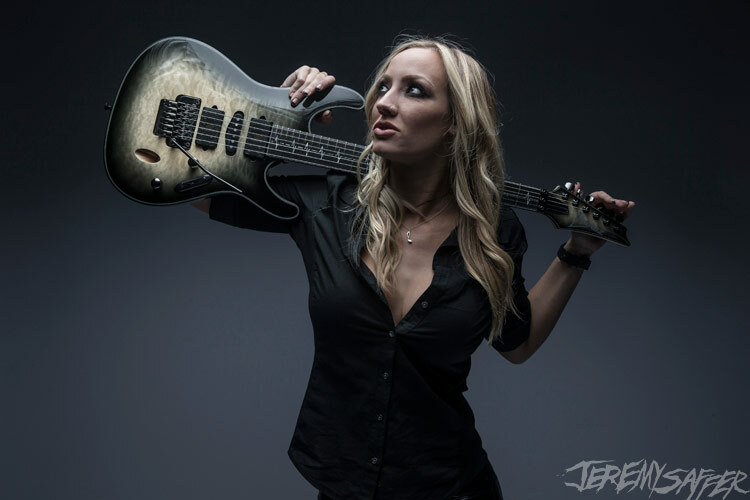 When Josh first started managing me, he said, “What do you want?” And I said, “I want to do a solo album, I want to have a signature guitar, and I want to be on a magazine cover and be in ads.” And all three of those things happened. After Wrestlemania, he said, “What’s next?” And I said, “NFL,” and that happened, so I don’t know what would be next. I’d like to play with someone like Lady Gaga or P!nk, or something like that. I think that would be really fun. Do you have any tips for someone who wants to get to your level of playing? Be persistent, don’t take criticism too harshly, always be early, practice a lot. One of the coolest things is seeing how many guitarists and young women are inspired by you—a woman shredding on stage and absolutely killing it every single show. How does it feel to know you are inspiring so many people? It’s amazing. It still surprises me every time when someone says that. I remember when I was growing up being a guitar player, I didn’t have any female heroes, so to get to be that for a new generation and show everyone that it can be done if you’re willing to put in the time and the work, that’s a responsibility I don’t take lightly and I’m very grateful for that opportunity. 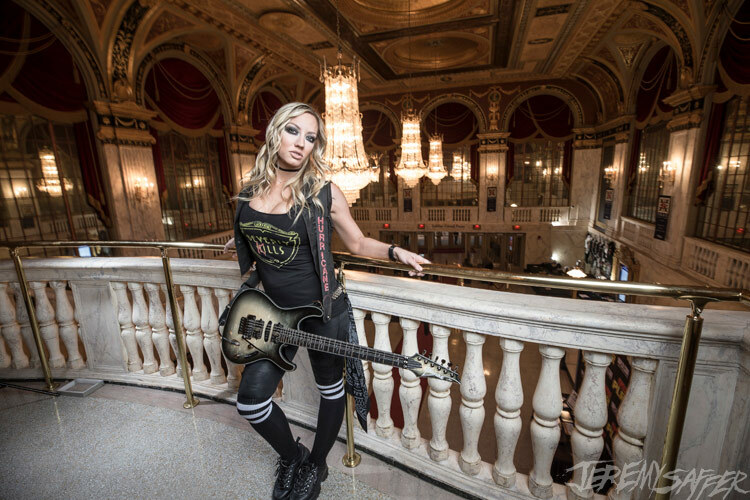 Follow Nita’s updates, tour, and more on her Official Website. 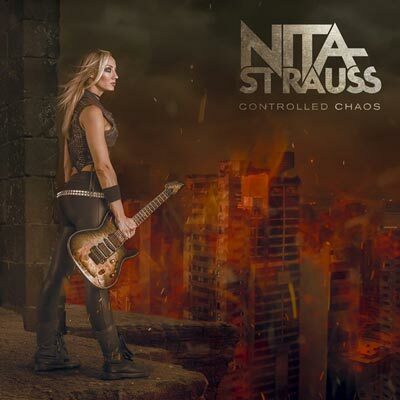 Pick up a copy of her new incredible album Controlled Chaos by clicking the album art below.